The recommendation comes after concerns about the fairness of superdelegates during the 2016 election. 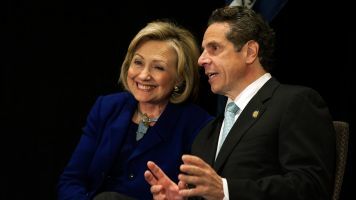 The commission tasked with reunifying the Democratic Party has released its first batch of recommendations, and one in particular would be a pretty big change for the party. The Democratic Party's Unity Reform Commission says the party should cut so-called "superdelegates" by almost 60 percent. The commission was founded after some Democratic delegates called into question the party's nomination process in 2016. It's made up of 21 Democrats picked out by Hillary Clinton, Bernie Sanders and DNC Chairman Tom Perez. Related Story What Are Superdelegates, And Why Do They Matter? You might remember the term "superdelegate" from last year's election. They're also known as unpledged delegates because they don't have to vote based on their states' primary results. And they're all party elites. Right now, every Democratic member of Congress, every Democratic governor and all elected members of the Democratic National Committee are automatically superdelegates. That makes them pretty controversial. During the 2016 presidential campaign, some people — including then-candidate Donald Trump — suggested Sanders could have won the Democratic nomination if it weren't for superdelegates, though Politifact says that's not true. As it stands right now, superdelegates only make up about 20 percent of the delegates needed to win the party's nomination. The commission says eliminating some of the superdelegates is just one way to help make the Democratic Party's presidential nomination process more inclusive.